Refrigerated Boxes and various other types of refrigeration equipment. Our customers are made aware of our service rates before any service is scheduled. We have sign offs for all new service customers, sign offs for equipment orders and sign offs for large repairs. This is done to ensure we are on the same page with our customers. In most cases, we will have a service technician on site within the same day a service request is placed. We do everything we can to make sure the customer is back up and running with minimal down time. We guarantee service within a 24-hour period for all equipment lease customers. Our customers have noted that they trusted us due to our credibility in the marketplace. Most of our business comes through word of mouth from other customers. We work very hard to exceed the expectations of our customers and want them to tell everyone they had a great experience with us. While we are not perfect in every aspect, we strive to be 100% in all that we do. Yes, we take credit cards. We also offer leasing programs for those that don’t want to worry about equipment maintenance and lease to purchase options for customers that want to own their equipment. We guarantee everything that we do. If you are not satisfied with a service, please let us know and we will make it right. 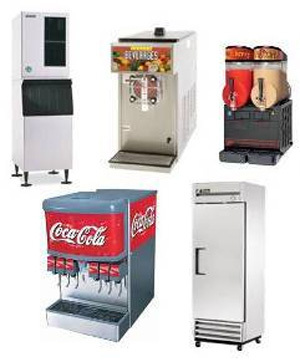 All of our technicians are trained and certified by all the major ice machine and refrigeration manufacturers. In addition to a professionally trained staff, we are a Hoshizaki HCSR and Scotsman ICECARE warranty agents.